I love to see people expressing themselves through clothes. How their personality shines through. And I love wardrobe_remix. So one day, as I was browsing photos I stopped and wondered just how great it would be if I could meet some of these people, get to know what inspires them, what they think and cherish. Then, the next second I stopped and realised I can do that! Naturally, the easiest way to do it is through an interview. Simple, right? For the first attempt, I asked one of my absolute favourite wardrobe-remixer Eva (also known as IBelieveInUnicorns) to answer some questions about herself and her style. And you know what? She is indeed amazing. Daiane: Let's start with some basics about yourself. Eva: My name is Eva and I'm 17 years old. I live in Bern, the capital of Switzerland. I'm currently still in school with art as a major. D:How would you define your personal style? E:My style's quite hard to describe since it changes so often. But in general I'd say it's very storybook-like with a whimsy twist. E: Practically everything. Of course wardrobe-remix but also movies, art, children's book illustrations, literature, old photographs and nature. D:What couldn't you live without? E:My sketchbook, my two lovely cats and having the time to lie down in the grass and watch clouds fly by. D:Whose style do you admire? E:The two people whose style I admire the most are the two wardrobe_remix users sunshineupton and thriftcandy. Both have a wonderful hippie sensibility with amazing attention to detail that never ceases to amaze me. D:What do you do in your spare time? E: I read quite a lot, at the moment Jane Eyre which is wonderful. In addition to that I draw and sew quite a lot and I love watching movies. Also, I have to admit to be quite a geek, so I read lots of comics and enjoy sci-fi quite a bit. D:If you could fill your wardrobe with the collection of any fashion designer in the world, who would it be and why? E:I'd say none of them. I'm really not very interested in high fashion to be honest. I'd rather go to a thrift store and buy as much as I'd like there. D:What are you loving right now? D:What are your must-haves for this fall? E:I have just watched the movie "Dancer in the dark" and I am now determined to find a little brown woollen cardigan like the one Björk is wearing in the movie. D:Anything nobody else knows about you? E:Sometimes when I get bored and annoyed with the world, I dream of running away with a gypsy clan and spending my life travelling in a little wooden caravan full of wondrous treasures and magic. It's my favourite daydream. Isn't she just fabulous? If you want to see more of her outfits, visit her flickr page. 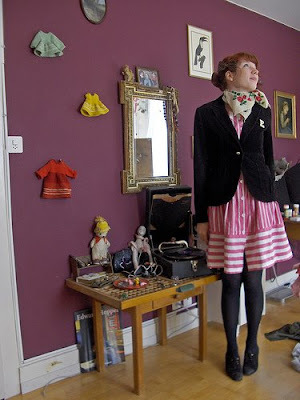 I love her photos on wardrobe-remix if only for the amazing decor of the room she poses in. Oh, she is one of my favorite remixers! 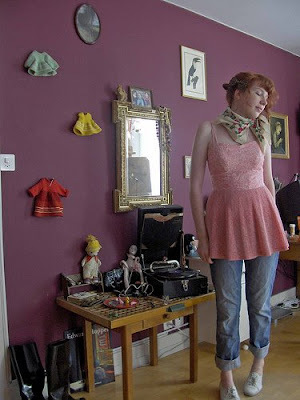 I especially love her room and the fact that dolls' clothes hang on the walls.